Copy or upload theme files exported from Artisteer into the newly created <YourThemeName> folder. Log in to your WordPress administration panel and select Appearance -> Themes. In the 'Available Themes' section find your theme title and screenshot, then click the 'Activate' link to activate it. If you use latter versions of WordPress (2.8-3.x),there is an alternative way for installing new themes. In the versions 2.8 and 2.9 you can install a theme by taking the path Appearance -> Add New Themes from your administration panel, and if you have WordPress 3.x - by selecting the new tab "Install Themes" at Appearance -> Themes -> Install Themes. 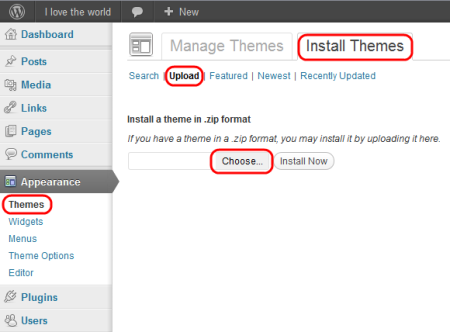 Use the Upload link in the top menu to upload and install a zipped copy of a theme exported from Artisteer. Click the "Add Content" button if you import content for the first time. Click the "Replace Imported Content" button if you have re-exported the theme from Artisteer (e.g., with the edited articles). Note: If you want to import content, enable please "Include Content" in Artisteer before exporting the theme. Starting with Artisteer 4.1 creation of Footer Widget Areas is supported. For more information please refer to this section. Go to Appearance -> Widgets and choose the widget you'd like to edit. Under the Theme Options -> Appearance select the appropriate widget appearance: as the rest of sidebar, as a block, as a post or as simple text. Go to Appearance -> Widgets and add a widget to the Header Widget Area. Your widget will appear in the top left corner of the Header. Use a debug tool like Mozilla Firebug to define and copy the widget id. Starting with version 4 Artisteer supports Custom Position control in Header. This new control is used for creating multiple additional widget areas in Header after template export. 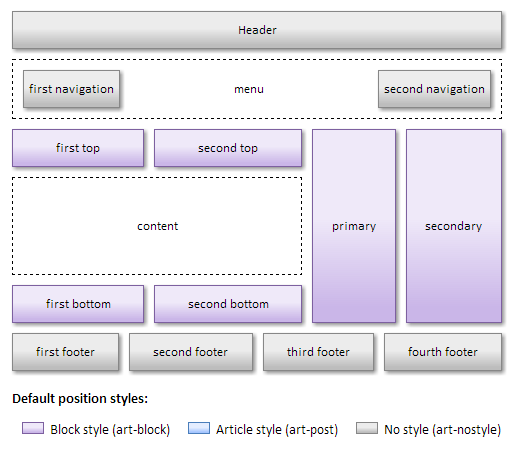 Navigate Header tab -> Insert -> Controls -> Position. Right-click on the control-ID -> select Options, and put the custom ID in the Name field (e.g. MyControl). After exporting and installing the template go to Wordpress Dashboard -> Appearance -> Widgets, create a widget and assign it to the widget area created by this control in Artisteer. The "Name" option in Position control's Options in Artisteer at the same time defines the name of a new widget area and the ID of the container, which can be used later for adding extra styles for this widget area in the style.css file. The code can be added to the end of the style.css file in Wordpress Dashboard -> Appearance -> Editor or in Artisteer Export Options (File -> Export -> CSS Options) before export. You can add a vertical menu from WordPress Administration (for dynamic sidebars) by going to Appearance -> Widgets -> Vertical menu. After adding the menu you can select its source by pressing "Edit" and specifying the source as "Pages", or "Categories", or "Custom Menu". Items in Vertical Menus can be grouped by a special menu item type called separator. For such menu items the URL is not assigned, which means they do not link to a particular web page, but serve as list items that name certain groups of links. 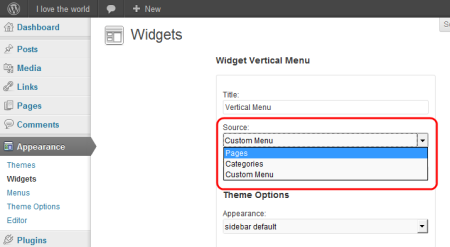 Starting from version 3.0 Beta 2, Artisteer templates for WordPress support Vertical Menus with separators. To enable menu separators, please update Artisteer, open your .artx project, re-export the template and apply it to WordPress. 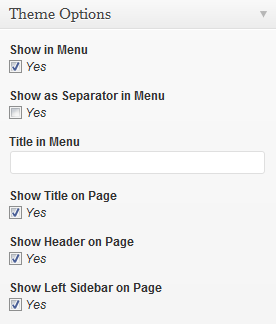 Create/Open your custom Vertical Menu in Dashboard -> Appearance -> Menus -> [custom menu name]. Go to the "Custom Links" block, enter # symbol in the URL field and name the separator (e.g. my separator 1). Press "Add to Menu" and see the newly created separator in the list with other Vertical Menu items. Continue the procedure to add more separator menu items. Create new menu items or drag and drop the existing items to place them inside the separator menu item. Press "Save Menu" and go to your website to check the Vertical Menu. Go to Appearance -> Widgets and choose the widget you'd like to show on particular pages. Click "Edit" and under the "Theme Options" choose to display the widget on all pages except the selected page or specify the pages where the widget is displayed. In Artisteer 4 you can customize particular page layout options such as whether to show it in menu, or to show header on this page etc. Go to Wordpress Administration -> Pages. Choose the particular page out of the list and click "Edit". 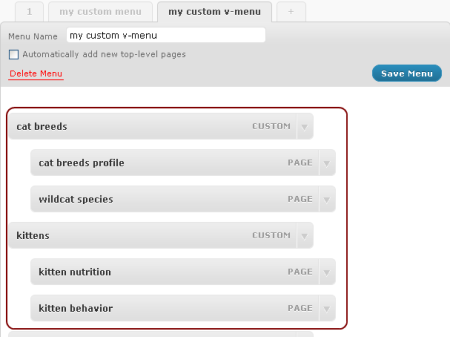 Customize the page features under the "Theme Options". Choose the page you want to set the particular header image on, and click "Edit". Click "Set header image" under the "Page Header Image". Choose and upload the image. Customize the alignment, size and other image options; edit the image, if necessary. Click the "Save all changes" button. To include a different or additional language support in your Worpdress theme please find and copy the desired language files into your specific Wordpress theme folder. or on the Wordpress Website at http://codex.wordpress.org/WordPress_Localization. To select a different language than your current Wordpress language, change the "define" function in the wp-config.php file, for example: define('WPLANG', 'de_DE'). To edit translations for your language please download and install Codestyling Localization plug-in from http://wordpress.org/extend/plugins/codestyling-localization/. Then in WordPress administration select Manage -> Localization. Starting from Artisteer 3.0 the footer dummy text can be customized directly in Artisteer (Footer > Text... dialog). This text will not appear on your website. 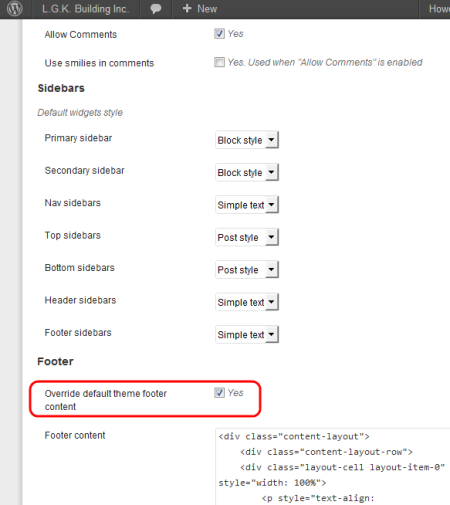 To change the content of your Footer go to WP Administration -> Appearance-> Theme Options -> Footer content. Starting with version 4.1 Artisteer generates footer widget areas by Content Layout cells in Footer. Please navigate WP Dashboard -> Appearance -> Theme Options -> Footer.